Recently, I linked to a post about how materialists use theological arguments, as seen here. Essentially, they claim that since they think God would not create something in a certain way, he did not do the creating, therefore, evolution. A few days later, I came across the article featured below and learned an expensive word for that approach: dysteleological. I wrote about teleology a spell back, (short form: teleology is design in nature for specific purposes) about how some owlhoots are denying their own purposeless evolutionary beliefs and giving their false god the ability to do design work. So, you can see the first part, dys, as in dystopia, dysfunctional, dyslexic, and so on, then put it all together. Proponents of atoms-to-animals evolution have used the dysteleological argument about the panda's "thumb". Yes, it has an appendage on the wrist that has a superficial resemblance to a thumb. Referring to it as a thumb, however, is misleading. Stephen Jay Gould wrote that the "thumb" is an example of bad design, so therefore (again), evolution. Not hardly! This is essentially circular reasoning and other fallacies based on arbitrary assertions. (Not surprisingly, an anti-creationist website is named after the panda's alleged thumb. I reckon that folks who use bad reasoning have to stick together.) A panda does not need a human-like thumb, and what it was created to have, works just fine, thanks. 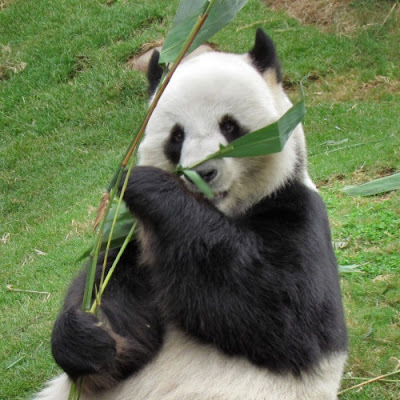 The panda’s ‘odd’ forelimb arrangement has an enlarged wristbone ‘digit’ commonly called the panda’s ‘thumb’. Evolutionists have argued that this arrangement is bad design, and so the panda would not have been created but must have evolved. However, their argument is based on five premises, four of which are shown to be false. One false premise is sufficient to destroy an argument. The evidence of design and therefore for a designer is incontrovertible, so the evolutionist is ‘without excuse’. To read the rest of this extremely interesting article (which was written while Gould was still alive), click on the long title, "The panda thumbs its nose at the dysteleological arguments of the atheist Stephen Jay Gould". Two short videos are below. One is where ridiculous homage is given to Papa Darwin (blessed be!) and using a dysteleological argument, all opinion and speculation, no science. Note the argument from incomplete information and omission of pertinent facts. The second video is a warning not to get careless around a cute wild animal.